Eazy recovery software tool creates backup or archive of popular applications. Application software knows where the actual data resides within storage media and which data is needed to create backup. That's why Eazy Backup is the Intelligent Backup and Restore tool. 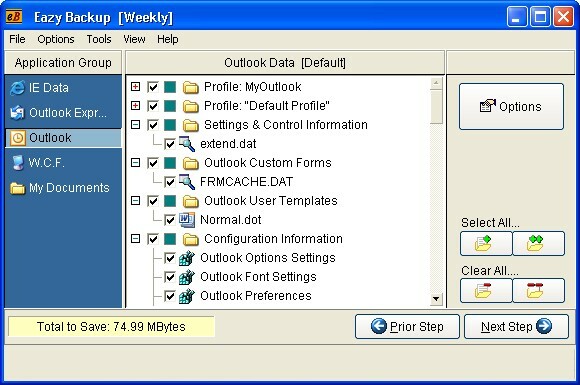 InSync is a high speed file and directory synchronizer with autmatic scheduling. Scheduled reminders for off-site storage of your backup files. Professional backup software specializing in security and remote backups. Qweas is providing links to Backup Software 4.0 as a courtesy, and makes no representations regarding Backup Software or any other applications or any information related thereto. Any questions, complaints or claims regarding this application Backup Software 4.0 must be directed to the appropriate software vendor. You may click the publisher link of Backup Software on the top of this page to get more details about the vendor.